AEFAC relies on participation from industry for its operations. The Founding Members bring considerable experience and support that is necessary for AEFAC to achieve its aims. AEFAC is currently developing a number of unified guidance documents on post installed and cast in anchors. These are intended to become codes of practice in Australia. Anchors are sensitive to installation and many failures associated with anchors have been caused by incorrect installation. The AEFAC Anchor Installer Certification program has been developed to promote best practice for installation and to safeguard human life. AEFAC is an industry focused initiative which aims to set the standards for the specification, selection, design and application of anchors and fasteners in Australia. Established in 2012, AEFAC is a consortium made up of Swinburne University of Technology, Ancon Building Products, Hilti (Aust. ), Hobson Engineering Co, ramsetreid, Powers Fasteners Australasia, Wurth Australia, Allthread Industries and Simpson Strong-Tie. 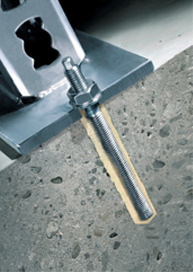 The main service of AEFAC to the Australian construction industry is to enhance the safety and efficiency associated with the use of structural anchors and fasteners. AEFAC is based at Swinburne University of Technology with access to state-of-the-art testing and research capabilities. The guidelines and resources being developed by AEFAC are intended to become the codes of practice in Australia.